Today's share is one I came across a couple of years ago that fascinated me & I shared it. Since I do not have my own classroom, I've not used in recently. However, I was in a classroom recently and noticed she had this site up. When I asked her about it, she told me she uses it often. Initially, it simply looks like a site that has a beautiful photo on it with a handful of circles at the bottom. Take a closer look . . . each of the circles offers a tool and each tool has a use in your classroom. The simplicity & options it provides is overwhelming! AND you can use more than one tool at a time, too! Type a message using the text tool; use the timer to show remaining time for a task; use the work symbols to show how students should be working; and use the random name picker to show who should come to conference with you ... all at the same time! The following is an overview of the tools provided. AND choose to roll one, two, or even three die! These three tools are found in the bottom right corner and pack a pretty powerful punch! SERIOUSLY! Check this out ... if your board is interactive, pull this up in a second and allow students to provide immediate feedback with a "smiley-scale" & you can instantly see (or hide) the results! don't care for the dock showing & would rather it not? Easy! And bring it back the same way. 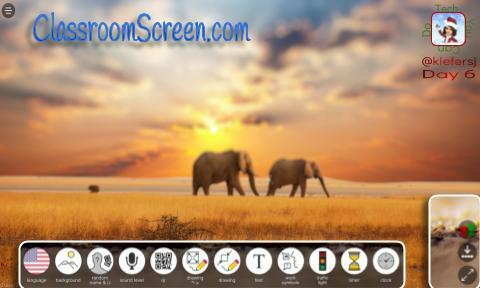 want your screen maximized? Use this tool to do so and enjoy! I'm sure there are things I've yet to discover. I hope you find this site useful!